I’ve often wondered how much good could be accomplished in the world if women were able to completely obliterate negative thoughts/self-talk from their minds. I happen to believe that women are powerful beyond measure when they are focused on the good in themselves and others. But, sadly, it has been my experience that the majority of women have a battle going on in their mind all day long. Our desires to do good are overcome by thoughts of inadequacy, fear, guilt, and just the overall idea that we are not nearly as thin, beautiful, smart, talented, gifted, and valuable as all the other women we see around us. It hurts my heart just thinking about it. 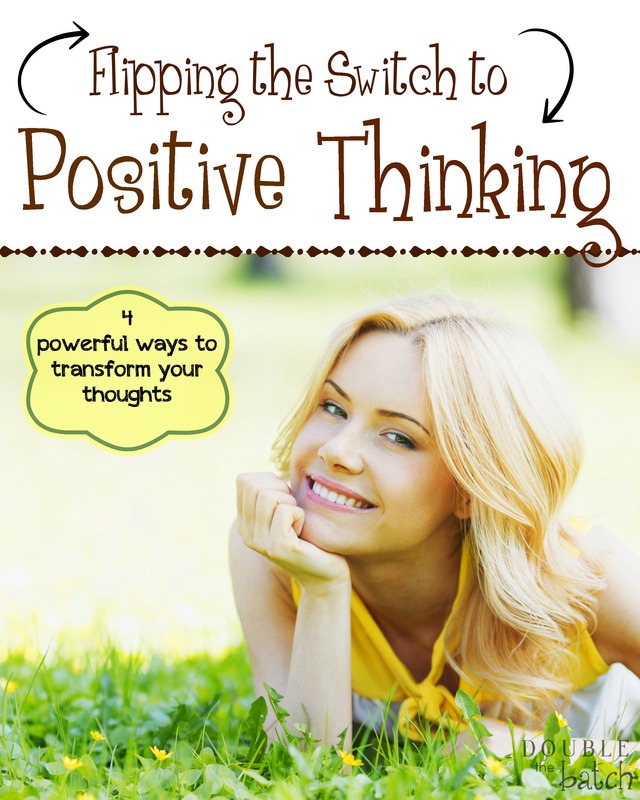 So, I wanted to suggest 4 simple, but powerful ways to transform our thoughts and start living life in a whole new way. 1- RECOGNIZE WHERE NEGATIVE THOUGHTS ARE COMING FROM. I think we mistakenly assume that these thoughts are from our own mind, which we ironically think is capable of making a sound judgement of our own worth in comparison to others, even though our judgement is generally that we are worthless. Here is the TRUTH. The negative thoughts are NOT coming from your own mind. They are LIES planted in your mind by Satan who loves nothing more than keeping women from reaching their potential and becoming a powerful force for good in the world by absorbing their time and emotional energy with negative thoughts about themselves. Some of us have believed these lies for so long that we can’t distinguish them from our own thoughts, and we let them play over and over in our mind all day long as we see ourselves failing to measure up in everything we try to do. So, begin today to recognize these negative thoughts as LIES from your greatest adversary. Stop his endless debilitating chatter by calling him out and reminding him who you really are. 2- FIGHT LIES WITH TRUTH. Lies can only be fought with TRUTH. And the truth is, who you really are is a child of God with endless potential for good. You have the ability to choose happiness. You have the ability to change the course of your life, no matter how crappy and unfair it may have been up until this moment, or how many mistakes you may have made. By the power of the thoughts you allow to fill your mind, you can create a life that is full of peace and joy, regardless of the bad things that happened, and may still happen, in your life. And this truth will find its way into your mind when you start ridding your mind of the lies, because this is the message that God will be whispering to your mind and heart over and over again until you are ready to start listening: You are precious to me. You are loved more than you can comprehend. You are enough. You can do great things. You can change. You can lift others. You can heal. You can forgive. You can see and bring out the good in others. You were created to feel joy. Cling to these truths with every ounce of faith that you can muster, remembering that God is a God of truth and cannot lie. And when you start to sense the lies creeping back in, repeat these truths in your mind. Reminding Satan who you really are robs him of his power over you, and just like any bully, when you start to stand up for yourself, he will begin to retreat. To illustrate, let me share a personal experience. I remember once having a particularly hard day as a mom. I had been yelling at my kids and felt like I had lost control of them and myself. I was frustrated and overwhelmed and at my whits end. As I stood at my sink doing dishes, these thoughts started to enter my mind: “You are a terrible mom. No matter how hard you try, you are never going to stop yelling at your kids. Maybe you shouldn’t have even had kids in the first place. They need someone better than you.” I listened for a moment before I realized what was going on. Fortunately, I was able to recognize that I don’t generally beat up on myself that way, and I know the Lord would not speak to me that way, so it must be Satan trying to take me down in a moment of vulnerability. I told Satan off in my own little way, and I began to pray, talking to God about my frustrations and my desire to change and asking for His help to remove Satan’s influence from my mind. I was filled with God’s love for me and reminders that I was a good mom having a bad day. That I had so much to offer my kids, and that the frustrations of motherhood were there to teach me and refine me. I was filled with a desire to move forward with faith. First— Focus on feeling God’s love for you. Let it fill your heart leaving no room for anger, hate, doubt, fear, despair, critical feelings toward yourself or others, bitterness, or resentment. Second–Focus on feeling love, appreciation, and gratitude for your blessings and for the people around you. Gratitude in all things- even and especially in our trials- has a powerful effect on our mind. Third— Focus on reaching out to others with love in whatever way the Lord is inspiring you to. You will find that you feel more inspiration to reach out to others when you have removed the negative thoughts from your mind and the negative emotions from your heart. And you don’t need to reach out to others the way the “perfect” mother down the street does. You just have to do whatever God is inspiring you to do right now in this very moment. When you do these three things, it becomes much easier to appreciate yourself for who you are and others for who they are instead of constantly resenting others’ strengths and focusing on your own weaknesses. We are all just here on Earth learning through our own experiences at our own pace. 4- SERVE OTHERS. Satan can’t do a whole lot to influence our thoughts when we are busy helping someone along their way. Whether it is talking kindly to the clerk at the grocery store, holding a door open for a stranger, taking a meal to someone who is sick, choosing not to criticize a child when they make a mistake, reading to your kids, visiting someone who is lonely- every loving act we perform not only lifts those we serve, but it lifts us, fills our lives with meaning and purpose, and verifies we have value in this world. It is proof that Satan is a liar and God’s whisperings are true. Living a life that is meaningful in the lives of others is the key to finding true joy and peace and the only way to discover who we really are as God’s children. It is an effective and protective shield that will help us keep the father of lies out of our hearts and minds, allowing God’s love to grow within us until we see ourselves and others the way God sees us. And with that vision, there is no end to the good we can do. Update: I recently came across this video that expresses a lot of the same thoughts and feelings I was having when I wrote this post in a very powerful way. It is a great thing to watch when you need to be reminded who you really are.